Plenty of country artists have made successful appearances on the pop charts, but few carry the unbounded versatility of Maren Morris. On her latest album, GIRL, Morris utilized her powerhouse vocals to expand both her genre and fan-base on a soundtrack filled with love, womanhood and having a damn good time. 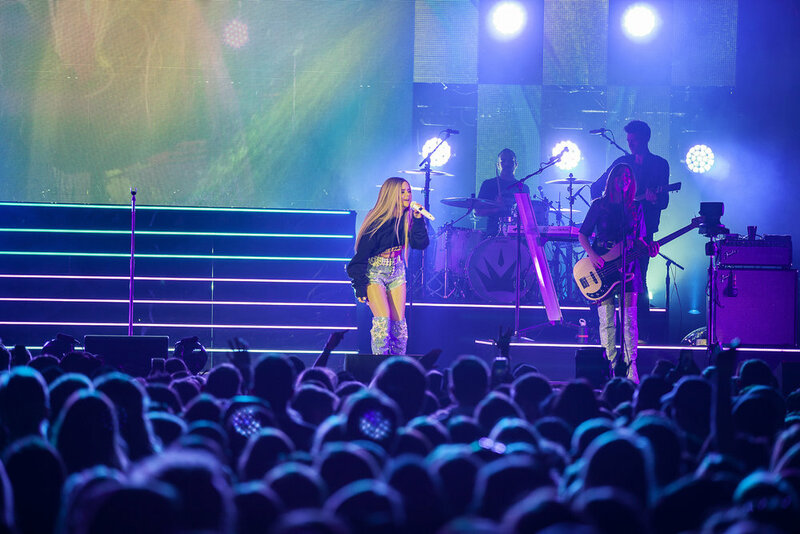 Maren Morris, Texas-born songwriter rose from the floor on a lift as the opening notes of her title track “Girl” played intermixed with crowd cheers. Morris stood strong in front of a gold crown as she sang, setting a tone for the stunning visuals and continuous messages of female empowerment to follow. The highlight early into her set was the bubble adorned dance party to “80s Mercedes,” a sleeper hit from her debut album HERO. Behind her a large screen flashed every color of the rainbow, neon-lit stairs shone bright, and clips of the 80s inspired music video played. The importance of each fan was not lost on Morris herself as she described how connected she felt to the sold-out crowd. Her latest album GIRL was released only a month before the Atlanta show with nearly every tour ticket being sold prior to anyone hearing Morris’ new music. An applaudable feat to say the least. She said, “It makes me so happy to see the songs everyone likes and to share [the album] with you all, because it’s been mine for so long.” The connection was clearly mutual as the crowd countered a heart-warming performance of “A Song for Everything” with their own rendition of “Happy Birthday” to Morris who turned what she jokingly called “29 and fine” the day before. One of the concerts most special moments was when Morris pulled back the curtain on the special love that fuels her songwriting process. The significance was evident in the quieter moments when her original lyrics could resonate like “To Hell and Back” when she sang, “Lucky for me, your kind of heaven’s been to hell and back.” Followed by a very passionate Morris laying down on stairs passionately singing about a burning love on “Make Out With Me”. Additional highlights, for the rowdy Georgia crowd were those where Morris tapped into her hard country roots. The opener Raelynn joined Morris onstage for a feisty duet of “All My Favorite People” that everyone unapologetically jammed to. “Rich” had a similar effect. Morris brought a rapper’s swagger to her country rhymes and the entire theater was glad to join in shouting the final chorus as Morris posed, smiling ear to ear. Morris ended the show with “The Middle,” her unpredictably successful collaboration with Zedd and Grey. During this song more than any, the impressive strides she’s made in her decade-long career are clear. Even more apparent, is how hard it will be to predict what Morris will do next, but with her talent, the sky is the limit. 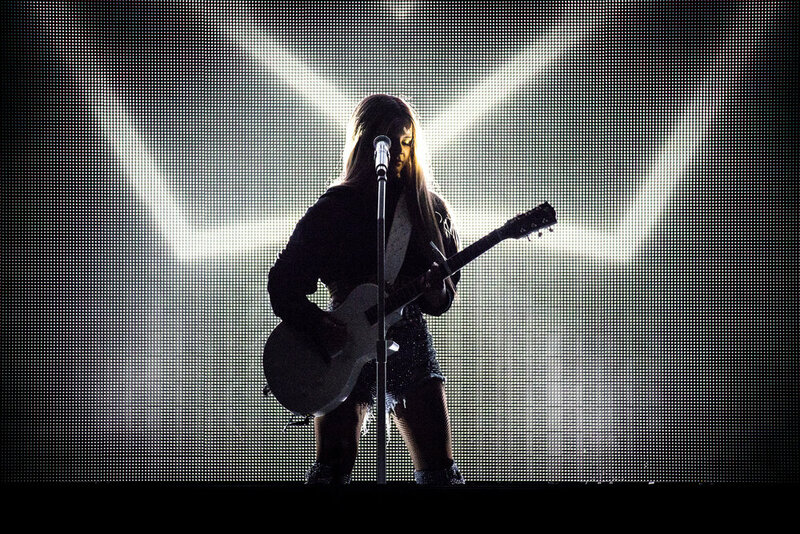 Catch Maren Morris for the remaining dates of her GIRL: The World Tour here. Photos by Terence Rushin for Bullet Music.